Hobgoblin is the second biggest selling bottled beer in the UK. 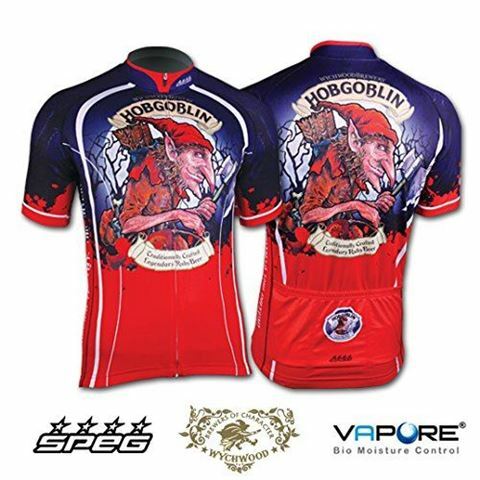 We are now proud to offer the original Hobgoblin red and blue cycling jersey here in the U.S. Stand out from the crowd in this eye catching beer jersey! 100% Vapore® bio moisture fabric. Vapore® Bio Moisture fabric is a fibre filament moisture system that siphons moisture away to evaporate. The filaments within the Vapore® yarn provide the channels that support the movement of moisture away from the skin. The fabric is soft to the touch, comfortable, flexible and very forgiving in its fit. Improved styling for a more fitted look and feel. Now upgraded with extra vented mesh side panels for extra breathability. High quality full length SBS hidden zip for style and comfort. Three large rear cargo pockets for mid ride essentials. Elasticated hip with no silicone gripper for extra comfort.